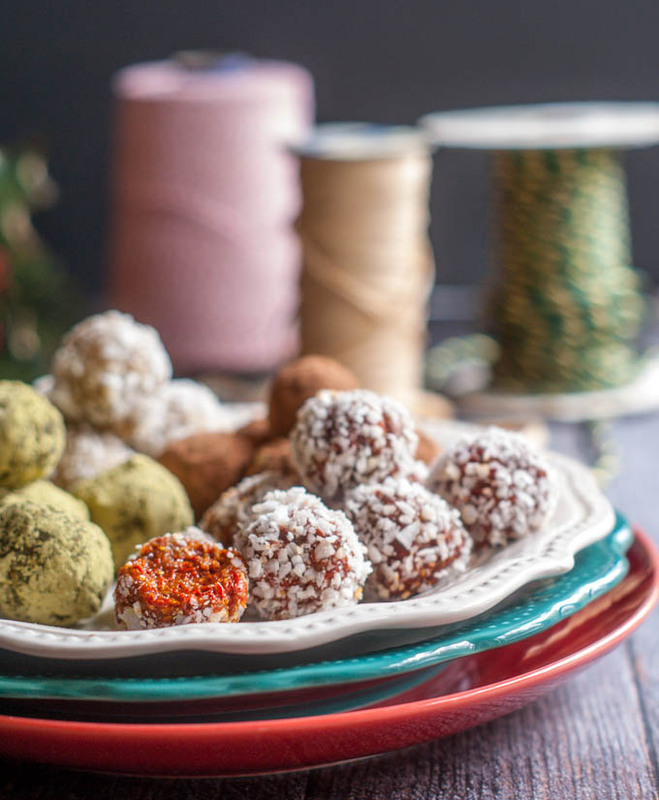 These superfoods fruit & nut bites are a fun and healthy gift you can give for the holidays. Only a few minutes to make and lots of combinations to try. I make these all the time for myself. Usually just the cacao ones because hey, I love chocolate. However I remembered along time ago seeing a similar recipe in a magazine using dried fruits and I thought I’d use superfoods to make them extra special. 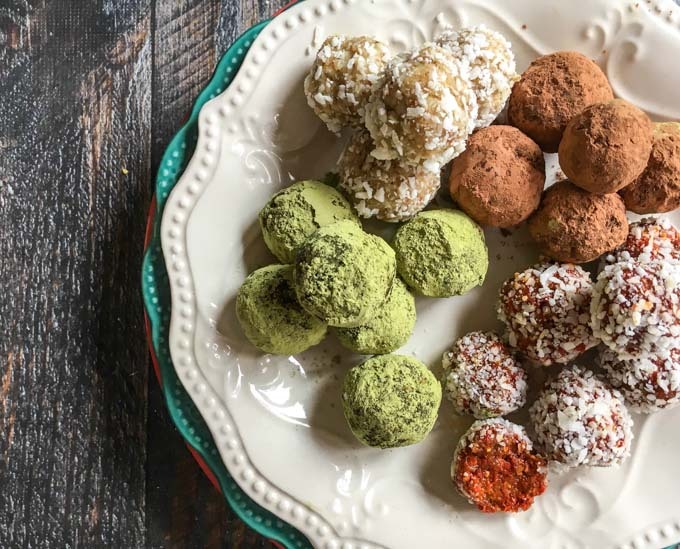 So today I bring you my superfoods fruit & nut bites for our Sunday Supper Holiday Food Gifts event. Even if you could care less about the healthy aspect of this recipe, you will still love these. And as a bonus they only take a few ingredients and minutes to make. Plus you can make a million combinations. The basic ratio is 1:1 nuts to dried fruit. My basic recipe below is for dates and walnuts. I like walnuts because they breakdown better than other nuts and dates are just very sweet. When you put both in a food processor you come up with dough like the ones below and then just roll them into balls and then in a topping. Store them in the refrigerator or freezer. 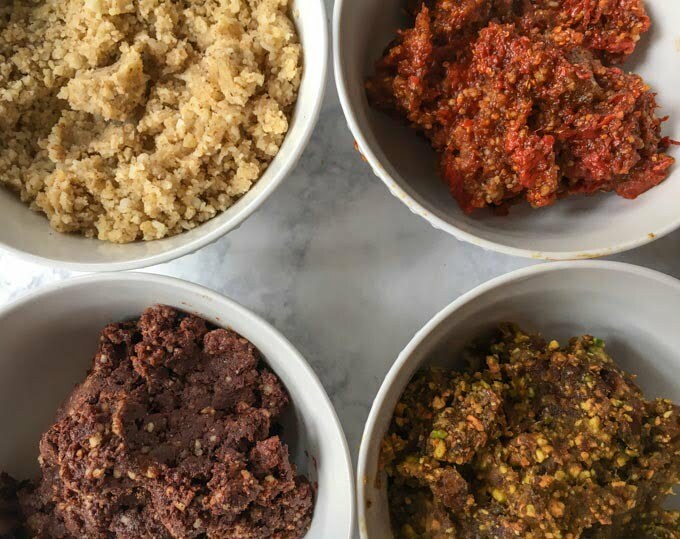 Left to right and top to bottom, we have coconut walnut, goji walnut, cacao date walnut and pistachio date. These are the superfoods I chose today: goji berries (antioxidants & anti-inflammatory), unsweetened coconut flakes (antibacterial, antiviral), cacao (antioxidants, magnesium & calcium), walnuts (antioxidants, heart & brain health), pistachios (antioxidants, heart health), dates (high fiber, easily digested) and matcha green tea (high antioxidants, calming energy). While these are sweet, they are not overly sweet. I would taste each dough and add a bit of sweetener if you like. For instance I added a bit of liquid vanilla stevia to the coconut ones and my husband liked them the best. I personally loved the goji berries. They were a bit tart but sweet. Here’s a tip for the dried fruit. Soak them for a few minutes in hot water and drain before processing. This will soften them and make the processing smoother. Also do the nuts first. You want the consistency to be sticky and crumbly. If you go too far it will liquify and turn to a nut butter. Below is the recipes for my 4 combinations but you can really use any nut and fruit combination that you like. Here is the finished product. The red ones are goji berries and walnuts rolled in coconut flakes. The green are pistachios and dates rolled in matcha green tea. The brown are walnuts, cacao and dates, rolled in cacao powder. And finally we have the walnut and coconut bites rolled in coconut. I hope you like these healthy treats. Thank you Christie from A Kitchen Hoors Adventures for hosting this week and please scroll down for more recipes. Enjoy! 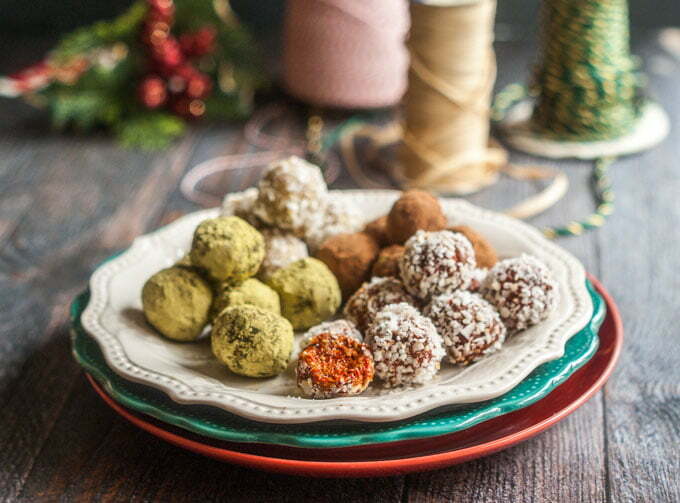 These superfoods fruit & nut bites are a fun and healthy gift you can give your family. Only a few minutes to make and lots of combinations to try. Take 1/2 cup of pitted dates and soak them in hot water for about 5 minutes until soft. In the meantime take 1/2 cup of walnuts and add to a food processor.Process until the walnuts are fine and sticky. If you over process they will turn into a nut butter. Add 2 tablespoons of cacao powder and pulse to mix. Drain the dates and add to the food processor and pulse until a sticky dough forms. Make balls out of the dough and roll in extra cacao powder and refrigerate. Take 1/2 cup of pitted dates and soak them in hot water for about 5 minutes until soft. In the meantime take 1/2 cup of pistachios and add to a food processor.Process until the pistachios are ground and a bit stickysticky. If you over process they will turn into a nut butter. In a small bowl add the matcha green tea and Swerve sweetener. 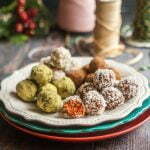 Make balls out of the dough and roll in the matcha green tea powder and refrigerate. Add 1/4 cup of coconut flakes and process in a food processor. Dump into a bowl and set aside for rolling in. Add the 1/2 cup coconut to the food processor and grind until fine. Add the walnuts and liquid stevia and process until a crumbly dough forms. If it seems to crumbly to form into balls, add a few drops of water. Form into balls and roll in the excess coconut flakes. Refrigerate or freeze. Add hot water to the goji berries and soak for 5 minutes. In the meantime take 1/2 cup of walnuts and add to a food processor.Process until the walnuts are fine and sticky. If you over process they will turn into a nut butter. Drain the goji berries and add to the food processor and pulse until a sticky dough forms. Make balls out of the dough and roll in ground coconut and refrigerate. ***Please Note*** Taste each dough and add addition sweetener or sugar if would like a sweeter product. The dates are pretty sweet but to some they may not be sweet enough. All of the combos you suggested sound great! I think that giving food as a gift during the holidays is a wonderful idea too! These look great! And we can always use something healthy to balance out the cookies. I love how versatile this recipe is. It’s good to keep some healthier snacks around during the holidays. These are the perfect gift for many of my friends. We’re in that phase of trying to loose a few pounds or at least hold steady for the season. I’m a big fan of snacks with low sugar that have enough protein to stave off hunger…. Thanks Monica, sometimes it’s nice to have something a little more simple and healthy among all the super sweet goodies during the holidays. I want the coconut walnut bites!!! LOVE these. They were my husband’s favorites too! Great idea and so colorful too! Yes I have to admit I’m a sucker for colorful things! What a great idea! I love how festive they look! These sound insanely good! Always nice to have a healthier treat around. Yes I’m trying this year to be more healthy. I love how colorful these are and being not too sweet is perfect for my tastes too. I love these little bites of healthy for the holidays! They look delicious and the perfect gift!